The City of Columbus water supply is supported by both surface water and groundwater sources and is the primary source of drinking water for the city. The City of Columbus is currently in the process of improvements to increase the system’s water supply and safe yield (the amount of water that can be supplied during an extended period of drought). Columbus is planning to expand groundwater wells, and is constructing three additional reservoirs in Delaware County. The continued efforts to maintain adequate sources of drinking water will enable the Dublin to support additional community growth. The construction of the first (and largest) of the upground reservoirs and associated piping was started in 2011 and is expected to be complete in 2013. The need for the other two reservoirs will be determined in future years and no construction dates have been set. The water distribution system supplying Dublin provides an average of approximately 5.9 million gallons of domestic water on a daily basis. The distribution system consists of over 227 miles of water distribution pipe ranging in size from two inches to 24 inches. The system contains 2,997 public fire hydrants and 2,346 water valves. System water storage is maintained by four booster stations (Rings Road, Post Road, Brand Road, and Tartan). The storage towers control system hydraulics across four pressure districts (Henderson, Smoky Row, Post and Tartan). As part of the analysis for the infrastructure to support the Bridge Street District, the water system model was upgraded to a dynamic model from a static model. The dynamic model provides information on how the system operates over time. This is a more accurate way to examine how the water distribution system functions with varying demand level throughout the day and seasons. The water transmission system was evaluated using a hydraulic model that simulates pressurized hydraulic systems. The model was created using only transmission lines larger than 12 inches in diameter and existing flow test information and water demand estimates. Using fire hydrant flow test data, the model was calibrated to existing conditions. Once existing conditions could be reliably reproduced, future demand was added allowing an evaluation of the existing transmission system. Potential improvements necessary to provide capacity for future demand based on the proposed future land use scenario could also be identified. The hydraulic model was used to determine the scope of improvements to the existing water distribution system to meet pressure and fire flow requirements. For the purposes of this preliminary analysis, the alternatives analyzed were not exhaustive; the improvements described are meant to provide an understanding for the level of improvements necessary to meet hydraulic requirements. Additional alternative studies should be performed to verify that the solution that is implemented is the best one for the city. Existing conditions were evaluated using a calibrated water distribution model to determine if the appropriate fire flows and minimum pressures could be maintained. Fire flows greater than 1,000 gallons per minute (gpm) are required, however greater than 2,500 gpm available at any location within the distribution system is most desirable. System pressures greater than 20 pounds per-square-inch (psi) are required during peak hourly demands; however, it pressures greater than 35 psi during peak hourly demands are desired to ensure adequate system performance. Under existing conditions the water system is generally capable of meeting average daily and maximum daily demands. Under peak hourly demands, the system is showing signs of lower pressures in the area of Rothesay Drive and Glick Road and in the vicinity of Memorial Drive and Gairloch Court, just east of Muirfield Drive. The pressure experienced in these areas is currently above 35 psi during peak hourly demands; however, these areas do represent the lowest pressures within the system. Muirfield Village and areas generally bounded by Avery Road to the west and Brandon Park to the south experience fire flows less than 2,500 gpm at a residual pressure of 20 psi under existing conditions. Areas east of the Scioto River bounded by Riverside Drive to the west, Hard Road to the north and Bright Road to the south experience fire flows less than 2,500 gpm at a residual pressure of 20 psi under existing conditions. Other smaller areas not capable of delivering desired fire flows can also be found in the areas of Ballantrae Loop near the Southwest Area and Tuller Ridge Drive in the Sawmill/SR 161 Area. An elevated storage tower was added to the model in the vicinity of Muirfield Village to address issues identified in this area and to provide increased hydraulic capacity. The results of modeling showed that pressures experienced in the area during peak hourly demands improved greatly, and the area was able to meet fire flow requirements. Additional modeling demonstrated several suitable locations for an elevated storage tower. In addition to elevated storage, an alternative was analyzed that would increase the capacity of water delivery to the affected area by constructing a large transmission line. While this alternative would resolve the existing deficiencies in the area, it would be more costly than elevated water storage and would be more disruptive during construction. A Preliminary Engineering Study was completed in 2010 to determine a site for the needed additional elevated water storage. The modeling done for the 2007 Community Plan was revisited including the previously proposed locations for the additional 500,000 gallon tower. Several public meetings were held to discuss the need and possible locations for the water tower. In May of 2010, Council approved the location at 10525 Dublin Road based on the modeling and public input. The land (approximately 3.8 acres) was purchased from the Muirfield Village Golf Club and the tank was constructed and became active in 2013. Based upon analysis, portions of the water distribution system along Avery Road and Glick Road appear to experience problems meeting fire flow requirements. The area is within a different pressure district than the majority of the Muirfield area. 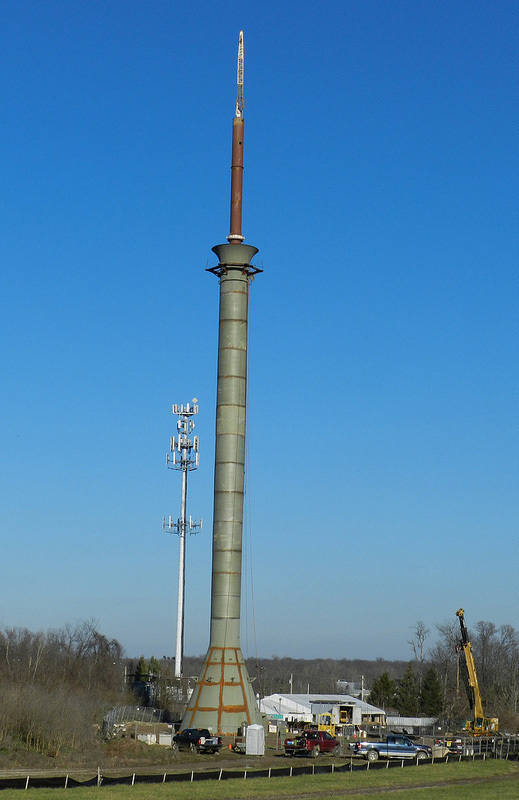 A 16-inch transmission line from the Tartan West Tank to the existing transmission line on Manley Road was added to the model to improve hydraulic capacity, and demonstrated sufficient fire flow requirements. A 12-inch transmission main was installed as part of the Tartan Ridge development project in 2010. This improvement was included in the modeling performed for the Dublin Road Water Tower and is sufficient to resolve the stated deficiencies in this area. East of the Scioto River, the water distribution system east of Riverside Drive, south of Hard Road and north of Bright Road may not be able to meet fire flow requirements. To represent the additional hydraulic capacity to this area, the water main on Sawmill Road south of I-270 was modeled to connect with the water main on Sawmill Road north of I-270. This improvement would require crossing I-270 and may be costly. The area does contain smaller water mains that are currently not included in the hydraulic model. While it is believed the looping of smaller mains in this area will provide sufficient fire flows, additional analyses will be performed to determine the specific impacts to this portion of the distribution system. The addition of hydraulic capacity to this area will improve the ability to meet fire flow requirements. A localized area in the vicinity of Ballantrae Loop experienced problems delivering the required fire flows under existing conditions. To provide additional hydraulic capacity to this area, a transmission line was added to the model in an effort to loop this dead end area with the existing water distribution system. 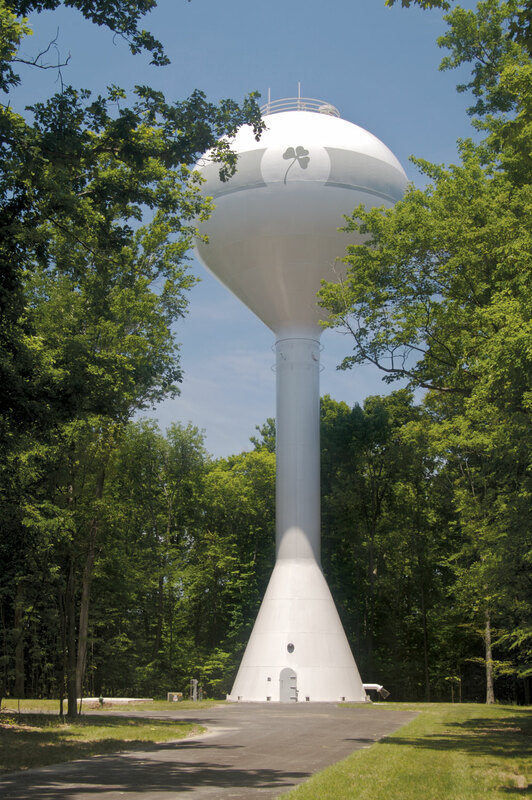 In addition, a 2.0 MGD water storage tower was modeled in the Darree Field Park to improve system performance in the southwest area of the city. The results of the model analysis proved the addition of this transmission line and elevated storage will enable the water system in this area to meet fire flow requirements. Accordingly, the proposed water tower was constructed and put into operation in 2010. The transmission mains were installed along Cosgray Road (from north of Shier Rings Road to the future entrance into Ballantrae) and along the Darree Fields driveway to provide connection to the Darree Fields Water Tower. In 2011, the extension of the 12-inch waterline into Ballantrae to address the pressure issues on Ballantrae Loop was installed per an approved Infrastructure Agreement with developer of Ballantrae. Water demand design criteria were based on a combination of existing City of Dublin specific data and industry standard values. An average daily demand of 259 gpd/EDU was used for estimating existing and future water demands for residential land use throughout the system. This value was determined through investigation of existing water use records. Other land uses utilized the sanitary sewer flow projection criteria to estimate the water demand throughout the system. After calibrating the model to existing system data, the impact of average daily demands on the system could be evaluated. Water demand projections were developed for the future land use plan. The table below represents the total water demands for the existing and future conditions. The increase in water demand to serve all development scenarios represents an almost 100 percent increase over current demands. Accordingly, the existing system will not be able to meet hydraulic requirements unless improvements are made. Areas identified with deficiencies under existing conditions exhibit further reductions in pressure and available fire flows. The Muirfield Area in the location of Rothesay and Gairloch will gradually develop pressures that are below the required 20 psi standard. The larger Muirfield area will develop pressures that are below the desired minimum pressure of 35 psi. Portions of the Muirfield area affected by lower than desired available fire flows under existing conditions will also gradually increase in size. Modeling shows that this lower than desired pressure will remain confined to the Muirfield area. Portions of the Southwest Area near the Ballantrae subdivision, particularly near Ballantrae Loop, will also exhibit signs of lower than desired pressure. Without additional improvements, this identified area will also eventually experience pressures lower than the required 20 psi. This area of lower pressure will gradually expand to include much of the Southwest Area, including south to Rings Road and Tuttle Crossing. Other portions of the region along SR 161, Post Road and Emerald Parkway will also develop pressures that are less than the desired minimum pressure of 35 psi. Areas east of the Scioto River, particularly those bounded by Riverside Drive to the west, Hard Road to the north and Bright Road to the south that currently exhibit lower than desired pressures will remain the same. However, the total available fire flow will continue to decrease in the area. Improvements to the water distribution system will be necessary to meet future peak hourly demands. The improvements to the existing distribution system necessary to meet acceptable peak hourly demand pressures and maximum daily fire flow requirements were included in the future conditions model. The results of the model showed the improvements were able to correct all of the problems in areas that were not able to meet pressure and fire flow requirements under future conditions. The expansion of development into Dublin’s planning area in the Negotiated Water and Sewer Service Area north of SR 161 will require additional storage capacity. While the Darree Fields water tower can meet initial storage requirements for short-term development potential, it is expected that future water demand will require the need for storage along the U.S. 33/Industrial Parkway corridor. A 2.0 MG elevated water storage tank may be necessary between U.S. 33 and Industrial Parkway, depending upon a determination of future service provision within the area. A site just north of Corporate Boulevard will provide a centralized location and can serve the Negotiated Area. The additional area proposed to be serviced by the water distribution system represents an additional 5.89 MGD in average water demand and an additional 27.0 MGD of peak hourly demand. To facilitate the growing demand on the system, a number of improvements have been implemented that will increase the system’s ability to provide adequate pressures and fire flow capacity. While it has been shown the improvements listed below will resolve many system constraints, it may be possible to reduce the scope of improvements through more detailed analysis. These projections and proposed improvements are based on the mix of land uses and densities as expressed by the preferred land use scenario. Significant alterations to these densities could affect the ability of the City to provide required water system pressure and fire flows.